The register now has twenty-two E24's on it. I will try to use this as a hub to organise events and gatherings in the near future. We are in the process of setting up a logo for the register and as soon as it has been verified, we can use this logo on our letterhead and embroided patches. Last edited by 635 tragic on Fri May 06, 2011 2:20 am, edited 1 time in total. Sounds good Bob, good work. Thanks for setting this up and for keeping us up to date. What Ellis said. Good on ya Bob. Just some logos we've been working on, would appreciate any feedback on preference and proposed alterations you may have. The Logo with the official BMW roundel on it has to be submitted and verified by BMW head-office. The other one - because it doesn't mention 'BMW' - doesn't need any verification to use it. I like the first one better, suggest moving the ACT and NSW text under the logo to make it more balanced and maybe remove the two lines as per Brian's suggestion. As some feedback on the above, the front of the cars doesn't say 6er to me and to the uninformed it could be any BMW from late 70s/early 80s. The shark silhouette is the defining shape of our cars that sets them apart and something utilising that is instantly recognisable. Also the use of the Motorsport colours suggest an M6 register rather than all E24s. As an idea, the logo on the t shirts that Jeff sold and Ellis had a major input in designing was very good and used the side view of the car. I'm not suggesting that as the logo but just pointing out the use of different profiles. Here's a go at a logo to consider using the tacho and stylised shark outline. My thoughts re the design are that it doesn't need a BMW logo as the register is principally 6 Series. Its not a BMW register, its a 6 Series register. There's no legitimate link or association with BMW, a BMW Club or anything BMW that we can claim association to. Perhaps leaving the BMW logo out will alleviate any risks of branding or copyright infringement. As previously posted i am running the Qld chapter for the 6 series register now. I have been also approached a few times about getting a badge made for the 6 series but in the context of a direct affiliation with BMW Clubs International. BMW clubs international however will only allow this to happen if there is an official Australian register and secondly that the person purchasing the badge is affiliated with a BMW club.. Thanks for bringing this to the forum for discussion. I like the idea of developing an Australian 6 Series Register. Here through bigcoupe we can see that there is 6er activity across all of Australia, so it would be good if the development of a Register could be inclusive of and benefit all the cars here in Oz. To me though it would be more of an issue in being able to comply with everything that 'official recognition' may require, and the burden that may place on whoever chooses to pursue this. Would it just extend to getting the logo right? Or are there other things that an officially recognised BMW Clubs International group is supposed to facilitate? Events, newsletters, drives, etc? These are all great things to do, but can become onerous on whoever has to take on the responsibilities for all of this. I note that you refer to the Qld group as a chapter, so if an Australian Register goes ahead it would probably be sensible to call the NSW group a chapter also. I'd like to hear Bob Burke's thoughts on this, given he's taken on the job of pulling together the NSW group. We're lucky to have two fine Roberts (Burke & Battle) voluntering to start these groups up, so your opinions are paramount as its your time that this may occupy the most. What exactly are 'their guidelines'? I would be happy to have a go at making something if it will help, if you wish it to include the stylised shark silhouette. G,day fellas, just making a few coments on an Australian Register. I don,t know if it would work. The message i,m getting is that not everyone is keen to run with BMW. By going the BMW way would mean a lot of regulations & guidelines to comply with. say we run with an Australian Register who is going to put their hand up to run it? I am quite happy to run the NSW,ACT Chapter. Also you then have to have somebody onboard to run a chapter in the other states & territory as well. I think we should wait & see how both our registers run for a while. Anyway that is my thoughts on the matter but i am happy for anymore feedback . Cheers bob. I don't see why this should have anything to do with the BMW company at all. A list of E24 owners and a place (here) for them to talk and organise drives and get togethers is surely as much as is needed. Brian kindly provides this part of the website for Australia, along with email i suggest we use it. Regarding buying official badges endorsed by BMW and all that, i have no interest. This is great initiative from everyone and I must say I like the idea of a national register, but I have no interest in having to join the BMW club in order to be listed on the register. From a newby point of view. I agree with Bob Burke, perhaps a national register may initially be too big a step with its management issues. Alternatively, state chapter leaders, could liaise with one another, pool their registers and and onpass info if/when required. I'll support State and / or National registers. I'm all for anything that supports the 6'er. Whatever happens we will be doing a badge up here in Queensland which will have BMW' "blessing". This of course doesnt stop anyone making their own "chapter" however the roundel cant be used for the same reason that i wouldn't want my companies emblem used without my permission... It is the most highly valued car emblem in the world apparently (maybe recently just pipped by toyota) so it is in their interest to protect it. At the end of the day local registers will always come and go however i thought that if it was registered with BMW then it would be a much longer term thing that wont just rest with one person until he either loses interest. or something happens that wont allow him/her doing it any more. The cars we all love were designed and built by BMW so i cant really see a negative in getting a register approved by them with a badge to suit. As far as being part of a BMW club then i realise that all car club activities are not everyones cup of tea however you certainly don't need to go to all (or any for that matter) events that they organise. We have many people here in Queensland that just go to track days and others that only go to coffee nights so it is up to yourselves to organise your own 6 series activities. Anyway we are getting close to something that we think will be approved by BMW and i will post it here before i send it. I would like to know what their guidelines are please. I would like to be assured that use of my stylised 6er silhouette in your group's badge, to be endorsed by BMW, will not result in the silhouette logo also becoming a BMW endorsed image and whether that will restrict its use in other applications. I obviously use it and I encourage others to make use of it too, and would like to know if by sending it off to BMW for approval may result in them restricting its use elsewhere. I will certainly make sure that this beautiful stylised logo does not become the property of anyone. I am sure that this wont be a problem and if it is then i wont use it. I am certain that they in no way want to run or control our register rather they just want to make sure that when the roundel is used , it is used in accordance with the rest of their material. This is very common with all large entities and BMW is no different. What they really want is a uniform look to the club based regalia. The stylised 6er is just what we add in the blank space which is left after the roundel and the printing. I have another version which i think will look great as a badge and will conform to their requirements and I will put it up here first to get your reaction. 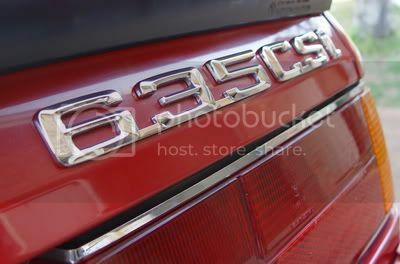 As the stylised 6er has already been used i cant see how they could possibly claim any intellectual property over it. Robertb wrote: I will certainly make sure that this beautiful stylised logo does not become the property of anyone. I am sure that this wont be a problem and if it is then i wont use it. G,day fellas, Just a reminder about the MID WINTER WANDER up in the Hunter Valley Gardens on the 19th of June. We will meet at about 8.00 am at Stocklands shopping centre at Glendale & meet up with other car clubs for a chit_chat , coffee & leave in convoy at 9.30 via Freemans Waterhole, Ellalong, Paxstone,Bellbird & Cessnock to Hunter Valley Gardens, Broke Rd, P1okolbin. Aprox 80 km. I would like to hear from any fellow 6er owers for our first gathering. I,ve decided not to worry about the logo situation for a while as we ponder on the different alternatives. Cheers Bob E24 6 SERIES REGISTER. Hi Bob, sorry but i won't be able to make this one. Sundays can be a bit problematic for me. Great thread and interesting discussion. I've been keen to see the 6 series register be re-invigorated for some time, so I think the national idea is certainly something to aim for, maybe built on the back of the success of local state chapters. For those that know me from this site, I've always been keen to establish a South Australian register/chapter of 6'er owners and have made some small progress on that score. In fact a few of us are looking at getting together Sunday June 5 for a cruise piggy-backing an endorsed BMW club event. We're simply hoping to connect with as many SA owners as possible to build up a database of contacts for regular local events and possibly organising an SA based national Sharkfest as discussed on other threads on this forum. And that maybe where an opportunity exists for us if there are certain financial, organisational or logistical expectations from BMW. We may simply be able to piggy-back our state BMW endorsed club sharing resources etc to meet those expectations. Just an idea. But as Bob has mentioned, my understanding is that BMW just want to check that their logo is represented correctly and that there is some consistancy in how BMW sanctioned clubs are represented. Either way, I'm all for a state based / come national register - BMW sanctioned or not. As far as logo's are concerned, those that have attended our previous Sharkfests will recall the logo I've attached, which I believe was designed by an international member of this forum and I also believe we have his blessing in using it for any bigcoupe or 6 series related material. Just be mindful though with any logo design for consideration, I'm assuming that were are focused on the E24 6 series - not the remake? Anyway, have a look and see what you think and let's see if we can establish an Australian register of some sort to help keep the passion alive for these cars and to support owners in their endevours. Who knows - if we present in numbers naionally, BMW Australia might just have to provide us with a little more recognition and support than we've received in the past??? Hi everyone.As promised i am posting the latest submission which i think will hopefully go close to what BMW are looking for. As usual your comments , good or bad are welcome..
Just be careful of the proportions of that stylised 6'er profile. On that version the roof line looks way too high and the rake down from rear to front looks excessive. You might want to reduce the oversall size of the profile a little as it looks a bit crammed in. You could then tilt the Southern Cross to about 45 degress which might give the logo a better balance. I don't have the facilities, but I wonder how that 'shark' profile might look instead without the "6 series" print? You will see below that i have superimposed a transparent version of the stylised logo over the E24 and it is extremely close. I may have squashed or expanded the original when i did it but i have now corrected it however it was pretty close. I have added the large pointer star as well. It's probably the illusion created by the silhouette and it's tight positioning within the blue box that does it. Have you tried any size variations to see how they look? Also, have you had any indication from BMW Australia as to any other expectations or legal or financial requirements to establishing the register and it's obvious association with the BMW brand? It'd be great if it was as simple as possible.